Mon-Thur 9 a.m. – 7 p.m.
Fri-Sat 9 a.m. – 5 p.m.
“Raindrops” made it into the competition this year. This is my miles piece for 2008 which means I enter it into as many shows as possible and try to get as many miles out of it as possible. This is it’s forth exhibit. 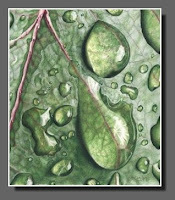 Rarely do I have a piece of artwork that I absolutely can not part with, and “Raindrops” may be one of those pieces. Everything just seemed to work correctly on this colored pencil piece. I used Primsacolor pencils on Stonehenge paper. There are several layers of color built and the finished piece is sprayed with a UV fixative. Dee Overly and Dan Trimbath. You’re going to see different views of the world when you look through the eyes of these two artists. You’ll want to stand back and take it all in when you gaze upon a landscape oil painting by Dan Trimbath. 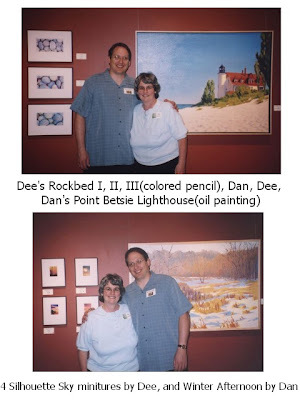 You’ll be drawn in close to examine the detail of some facet in nature that Dee Overly magnifies in a colored pencil painting. 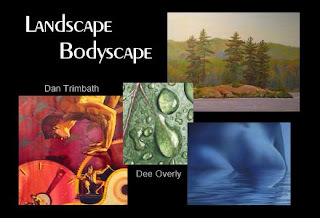 Their individual styles and love for landscape also carries over into their personal approach of portraying the human figure. Well, there you have it. That’s some of the formal wording that went out via press releases. But you never really know what the newspapers will actually print. Mostly, it’s just hopeful that the dates and times are listed correctly. Until the show opens, we’ll be taking a closer look at a few of the pieces that will be exhibited in the gallery of the Riverside Arts Center. Thanks for reading and have a grand day!